Born in Germany in 1571, Johannes Kepler one of the most intelligent figures in the period of human growth known as the Renaissance. Kepler came to learn a lot about the nature of the universe from his teacher. Tycho Brahe was a prominent figure in astronomy circles. After Brahe passed away, Kepler spent much of his time continuing the work of his teacher in addition to his own. The result was a set of three beautifully formed laws that mathematically related orbits to existing knowledge. His most famous law: "...orbits are elliptical..." was particularly outstanding, as it shattered the age old Greek (Aristotle) conception that motion in the heavens (space) was perfectly circular. Kepler had shown through mathematics that in fact orbits were not perfect circles. Rather they were elliptical, and egg-like. Kepler died in 1630. But planetary motion is still described within the context of "Kepler's Laws". After many experiments, Kepler discovered that the planets move on ellipses around the Sun. An ellipse is kind of a stretched out circle. A real circle has the same width, or diameter, whether you measure it across or up and down. But an ellipse has diameters of different lengths. How long the longest diameter is compared to the shortest one determines the eccentricity (e) of the ellipse; it's a measure of how stretched out the ellipse is. Circles have e=0 because their diameters are all the same. If an ellipse has one very short diameter, and one very long one, then it is a very stretched-out ellipse, and has an eccentricity nearly equal to 1. Planets do move on ellipses, but they are nearly circular (e very close to 0). Comets are a good example of objects in our solar system that may have very elliptical orbits. Compare the eccentricities and orbits of the objects in the diagram. Once Kepler figured out that planets move around the Sun on ellipses, he then discovered another interesting fact about the speeds of planets as they go around the Sun. Kepler realized that the line connecting the planet and the Sun sweeps out equal area in equal time. Look at the diagram to the left. What Kepler found is that it takes the same amount of time for the blue planet to go from A to B as it does to go from C to D. But the distance from C to D is much larger than that from A to B. It has to be so that the green regions have the same area. So the planet must be moving faster between C and D than it is between A and B. This means that when planets are near the Sun in their orbit, they move faster than when they are further away. The diagram above shows a planet on its elliptical orbit around the Sun. The shaded areas are of equal size, and were swept out in equal time, i.e. it took the same amount of time for the planet to move from A to B and from C to D.
Kepler's work led him to one more important discovery about the distances of planets. Kepler's 3rd law is a mathematical formula. It means that if you know how long it takes a planet to go around the Sun (P), then you can determine that planet's distance from the Sun (a). This formula also tells us that planets far away from the Sun take longer to go around the Sun than those that are close to the Sun. As explained in Kepler's first law, the eccentricity (e) is a number which measures how elliptical orbits are. If e=0, the orbit is a circle. All the planets have eccentricities close to 0, so they must have orbits which are nearly circular. 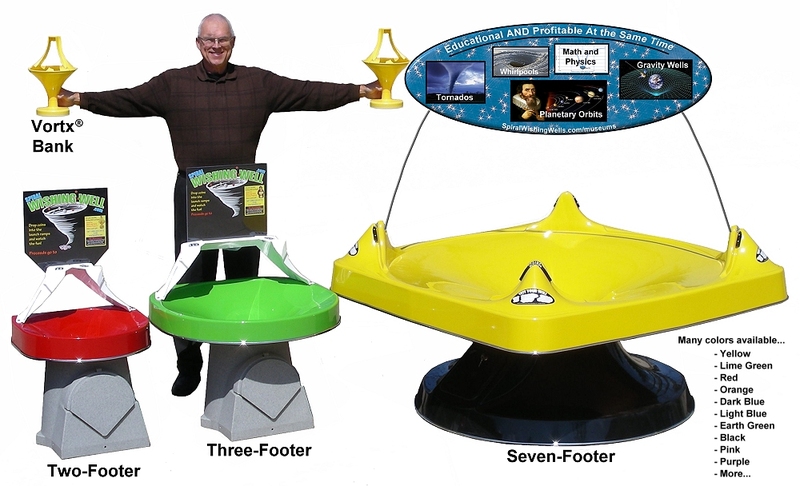 Spiral Wishing Wells demonstrate the laws of planetary motion as coins and balls (ball bearings and marbles) are launched in elliptical orbits. 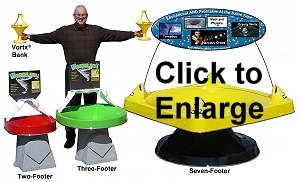 Click here to learn how to get your own mini-gravity-well and conduct various experiments.